We will warmly welcome you if you are visiting this marina owned by the Watersportvereniging of Alphen aan den Rijn. If you have any questions regarding your stay, you may contact our harbourmaster. He/she will do the upmost to make your stay as pleasant as possible. Alphen aan den Rijn and also the vicinity of the marina offers a lot of interesting things which could be a reason for you to moor and stay in this marina. Electricity: On the mooring-stages you will find special power outlets 16A for our visitors. Water: Drinking water is free of extra charge. But not allowed for washing your boat. Discharging Faeces: Visitors can discharge faeces free of charge with a faeces pump at the landing stage. For this please contact the harboumaster. Showers and toilets: Usage costs are included in the mooring fees for max. crew of 4 persons. If more persons on board, then at a small extra charge per extra person. Laundry: We have a washing and a dryer machine at your disposal against a small charge. Please contact the harboumaster before use. Wifi: At no extra cost you can use our Wifi. Please contact our harbourmaster for the password. The entrance gate: The gate is shut from 22.00 PM until 08.00 A.M. For use outside of this period an entrance code is needed which can be asked at the harbourmaster's. Note: Please use your ship's horn long-short-long or call 0172-435090. From the 1/4 until 30/9: 08.00 AM-12.30 PM, 13.00 PM-18.30 PM and19.00 PM-22.00 PM. From the 1/10 until 31/10: 08.00 AM-12.30 PM, 13.00 PM-18.30P M.
During the winter season drom 1/10 until 31/3 our harbour is closed for visitors. (*) Please contact our harbourmaster for using these services. The harbor is located at the Heimanswetering directly opposite to the beautifully restored Vrouwgeestmolen from 1797 of the Fam. Vrolijk. So from the marina you always have a beautiful Dutch view with a windmill. At sunset, the most beautiful pictures are taken from here. 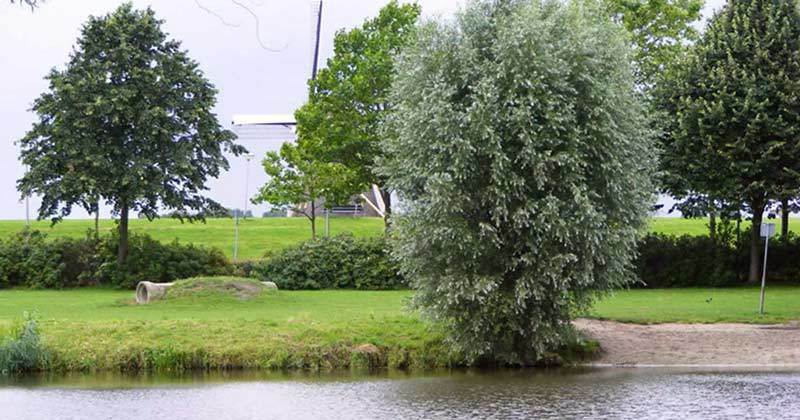 At 100 m from our entrance gate you will find the Wetering Park. There is a dog outlet/playground, where you can let your dog run or have a swim. 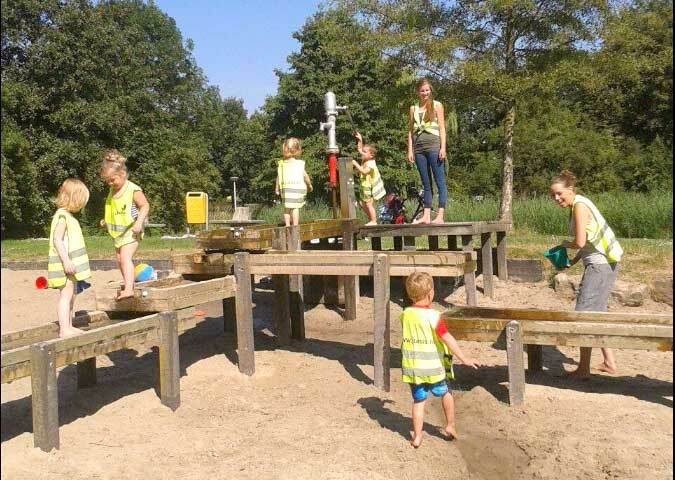 A hundred meters further on you will find the Weteringpark with a children's water playground, lawns and a soccer cage. Quite close to our entrance gate you will find the Wetering Park. There is a dog outlet/playground, where you can let your dog run or have a swim. A hundred meters further on you will find the Weteringpark with a children's water playground, lawns and a soccer cage. At 400 m distance from the port you can find the Bus stop Poortwachter. The city bus no. 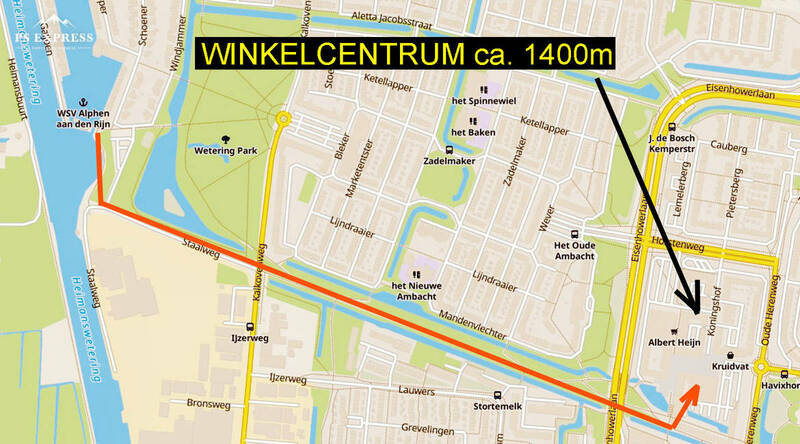 1, which take you to the center of Alphen aan den Rijn in 10 minutes (stop Centrum Hoge Zijde) or to the railway station. On the way back then take city bus no. 2 from the city to the marina (stop Poortwachter). These busses are scheduled each 30 min. If you walk 1.4 km in straight direction to the east, to the Herenhof, you can take a bus 470 to Schiphol Airport and then from there take bus 197 directly to the interesting center of Amsterdam next to the Rijksmuseum. To the north at the same distance from the harbor is Woubrugge and there you can take the bus to the interesting center of Leiden or to the Alrijne Hospital. Shops etc. are at 1.4 km away in the shopping center the Herenhof, with shops such as AH, Jumbo and Lidl etc. etc .. To make it even easier, there are free shopping bikes available at our marina for our visitors. There is a Chinese and a fast food restaurant in the Herenhof. In Woubrugge is a restaurant on this side of the water and a Chinese take-away and a fast food restaurant in the village directly on the other side of the water. In Alphen aan den Rijn you will find lots of restaurants. The small city of Alphen aan den Rijn has nice attractions such as Avifauna and Archeon, so also fun for the kids. It goes without saying that various boat trips can be made from the harbor in the immediate vicinity. You are here in the South-Holland-lake district. Boat trips such as a city-tour through Leiden, via the Kaag lakes and then back crossing the Braassemermeer, are even great for sailing yachts with a standing mast. Do you have a motorship or a sloop then, depending of the size of your ship, there are plenty of opportunities for an exciting cruise through the beautiful natural environments such as the Westeinderplas and the Nieuwkoopseplassen. A day at the Braassemermeer and the Hemmen is fun especially with children. To be short; a multi-day visit, also with children might be an interesting idea.